I know that most of you here are enthusiastic Magic players. You’re likely to do a lot of trading, buying, and selling. You attend a range of events, from FNM to PTQ, GP and other large events. Wizards knows this and does things to make Magic an awesome game for you. They also understand that a huge part of the playerbase is not here to gain value, or to win a tournament, or even to win a game. Many players are here because this game is a social interaction interwoven with a card game, and this interaction is tremendously fun. That’s how we get Conspiracy. I’m here to tell you that Conspiracy is draft- and multiplayer- based, and in a way that is going to be very, very fun. You are going to see people want to draft this set on a basis that I don’t think has been matched. Modern Masters may have come close, but the value on that set made it sought after in a different way. I’ve been lucky enough to draft almost every set of Magic. I’ve drafted Unglued and Unhinged. I’ve drafted the Ice Age block. I’ve helped build Reject Rare Cubes for drafting. Nothing is going to come close to what Conspiracy offers. The mechanics that alter the draft, even going so far as to add a ninth booster pack to the eight that are circulating. You get to peek at another pack, or see what else has been taken. The gameplay mechanics are fantastic too. Will of the Council allows for democracy, unless you have Brago’s Representative and then you’re a dictator. None of the choices are ever weak either. You’re going to get a great effect no matter the vote, and ‘helping’ others decide how to vote is going to be a game within the game. Dethrone is a simple and effective tool for deciding who to attack. I’m salivating at the thought of what effect is going to give other creatures dethrone. If we’re really lucky, we will get an effect that can be passed from player to player. “At the beginning of each combat step, all creatures controlled by target player gain Dethrone” would be something amazing to put on a creature. It’s super helpful that Dethrone triggers on the attack, not on the damage. Parley is just a great way to peek at what other players will have going on. Reveals and bonuses are a way to make the information palatable to those players because you’re usually getting much more of a bonus. I want you to go to the release events. Just play. Play as much as you can. This is a set that will reinforce the vast array of player types that Wizards has learned to accomodate. The same company that rules the Modern banned list with an iron fist also creates a set where Deal Broker is a card. There are going to be some unique cards available in Conspiracy, and with the presence of foils, might be incredibly pricey. Of note so far will be only the third foil printing of Brainstorm and the first non-promo foil of Swords to Plowshares. Exploration, an Urza’s Saga rare that did not get the reserved list treatment, will have its first foil. Dack Fayden in foil will also command a hefty price tag, but if you’re looking for a lower bar of entry on your speculations, I’d suggest going after foils of the cards that affect the draft, like Cogwork Librarian. Conspiracy is going to have a big effect on Cubes this way. Some purists won’t want to touch these sorts of cards, and I suspect that more will add them with gusto. Even the foil common versions will be worth a surprising amount after we’ve moved on to Magic 2015 and the Khans block. There’s one more thing to note about prices and Conspiracy: We’re going to have an effect on Journey into Nyx – Born of the Gods – Theros drafts. If your FNM is doing Conspiracy instead of JBT, that’s going to keep Theros block cards a little more scarce. 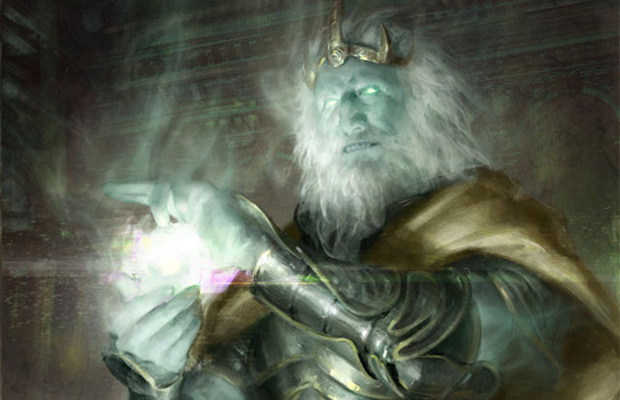 Modern Masters interfered with M14 this way and led to a dearth of Mutavault. It’s possible that Conspiracy makes Journey into Nyx cards even rarer than my 6:2:1 article would indicate. It’s possible that if Conspiracy sells well and get reprinted, it will affect the summer sales of M15 as well. I’m seeing preorder boxes for pretty close to MSRP. Some are even below, as if this were any old booster set. This is not the usual 36 packs, and if you get the chance to put away a box or two, it will be an easy way to grow your money over time. Booster boxes usually are, but ones that offer a unique and fun format, AND AT THE SAME TIME are stuffed full of value, should be treated with respect and purchased freely. And if anyone asks…I didn’t tell you. Shhh!